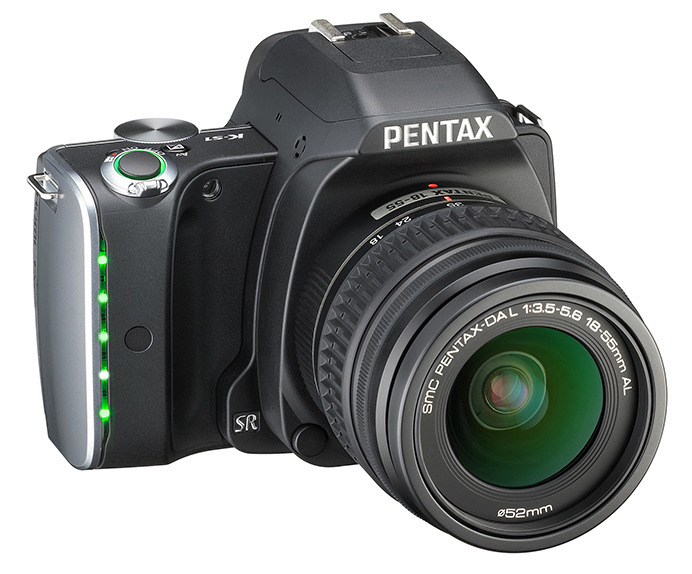 The first DSLR to feature flashing LED lights in the handgrip the new Pentax K-S1 also boasts a back-lit D-pad and mode dial on the rear for more intuitive control. With Pentax yet to dip its toe into the full frame DSLR pond the new K-S1 is another APS-C sensor offering that lines up alongside existing models such as the K-3, K-5 II and K-50. The Pentax K-S1 features a newly developed 20.1Mp APS-C CMOS sensor, equipped with Pentax’s Anti-Aliasing filter simulator, which was first introduced on the K3. With the actual Anti-Aliasing filter removed the filter simulator on the K-S1 reproduces the effect of an Anti Aliasing filter to minimize false colour and Moiré. The filter simulator offers 3 modes, including one to turn it off completely, giving photographers control over how much anti aliasing is applied. A nice idea, but probably a level of complexity beyond the entry-level market the Pentax K-S1 is aimed at. For image processing the K-S1 is equipped with Pentax’s Prime MII image engine and offers an ISO sensitivity range between ISO 100-51,200. 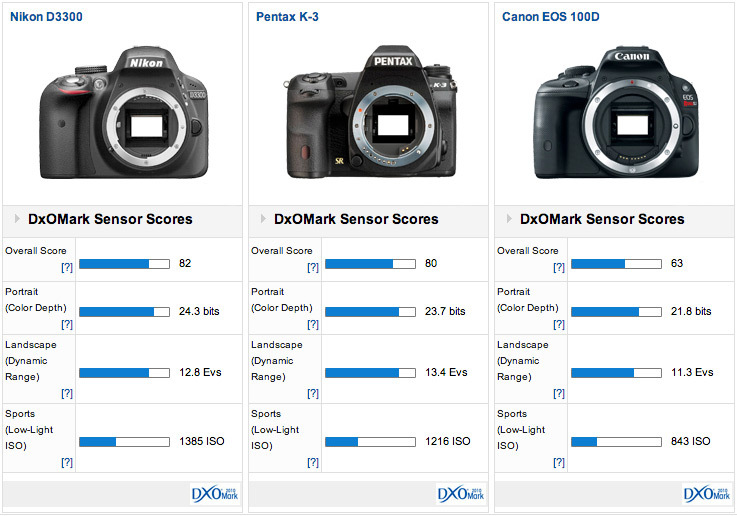 With a newly developed sensor it’s difficult to predict how well the Pentax K-S1 will perform in our DxOMark Sensor Scores, so make sure you check back for results soon, but previous Pentax APS-C models have ranked pretty well against the competition. With an overall DxOMark Sensor Score of 82 the Pentax K-5 IIs ranks highly in the APS-C sensor category only bettered by the Nikon D5200, D7100 and D5300. Sensor Scores for the Pentax K-3, which features the same AA filter simulator as the new Pentax K-S1, compare favourably to the entry-level DSLR competition from Nikon and Canon. As well as the flashing LED’s on the handgrip, the Pentax K-S1 features a back-lit D-pad on the rear to make it more user-friendly for beginners. Pentax have also shifted the Mode Dial, which is also illuminated on the K-S1, from its traditional position on the camera’s top plate and amalgamated it with the D-pad. The Pentax K-S1 utilises Pentax’s K-AF2 lens mount, making it compatible with almost all Pentax lenses and thanks to its sensor shift shake reduction system you’ll get up to 3.5 stops of anti-shake regardless of the lens you use. The K-S1’s optical viewfinder offers 100% coverage with a magnification of 0.95x and the fixed 3.0in LCD screen boasts a 921k-dot resolution. For video the Pentax K-S1 offers full HD 1920×1080 capture at 30/25/24 fps or 1280×720 at 60/50fps and can shoot still at a maximum frame rate of 5.4fps. The Pentax K-S1 will be available from mid September 2014 priced $749 / £549 body only, $99 / £599 with the SMC DA L 18-55mm kit lens or £679 for the dual lens kit.